Its been about 6 months since we helped Elmo find his forever home (he's doing well and his new family love him!). We kept a spot open for another foster dog but it had to be the right one. One that was a bit more challenging. Well we found him. 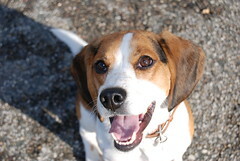 Meet Petey, a lovely 5 year old (estimated) beagle found in the woods in rural Ontario. The shelter was expecting a quick adoption for him since he's a sweety, but unfortunately, when he gets handled roughly (too quick or too strong touches to his hind area) he warning bites. A vet was bit when he was getting poked and prodded, and as a result, the shelter could not adopt him out. If he didn't find a foster home he would have been PTS (put to sleep). We took him into Foster via Big On Beagles (www.bigonbeagles.ca) and he'll likely be with us for a few months until we've had a chance to work on his behavioral issues. He has no training (he doesn't even know how to sit pretty to beg for food) but in the three days we've had him I can tell you he has tremendous potential - he is a VERY fast learner. 1. Crates are never used as punishment. 2. Use food or toys to get them to go in - don't ever push their behind him. Good examples would be a Kong stuffed with treats and cheese/peanut butter, or his dinner in a bowl. If you are in a pinch and can't wait, you can pick the dog up off his legs and "toss" him in - but this way you aren't turning it into a wrestling match. 3. The dog will likely fuss and fight and bark and howl to get out once he realizes that he's "stuck". In an ideal world, you would slowly build up the amount of time from seconds to minutes so that your dog doesn't get to that point while learning how to be in the crate, but since we're potty training an adult dog, we have no choice but to leave him in there while his bladder fills and he learns to hold it. 4. So you just have to let the dog howl and cry it out. The behavior will extinguish itself when the dog realizes all the fussing in world doesn't get them out. Alternatively, if the dog howls and barks and you cave and let them out, you've basically rewarded that behavior and really set yourself back. 5. During this "cry it out" phase, it would be a good idea to place him in a quiet area without traffic. You could use the basement or garage or a small guest room and close the windows/drapes/etc. to try to make this part bearable. If you left him in the living room while doing this, the comings and goings of family members could be regarded as a reward for his fussing. So he really needs to be isolated for a while to figure this out. 6. When he's ready to be let out, make sure he's totally quiet and relaxed. That way he'll notice that the only time he ever gets let out is in that state of relaxation. 7. If you're potty training, keep the leash near the crate so that when you let him out, you can leash him up and run, don't walk to the yard. The minute he relieves himself, act like you won the lottery and give him a piece of sandwich meat or a liver or other high value treat. Day 1 (night of arrival) - Brought crate to our bedroom and threw treats in to entice Petey in. He went in and we closed the door. He howled and whined from midnight to 2am and finally we were able to sleep. Friday was a tough day at work. Day 2 - He was crated all day for 2-3 hour shifts and only let out to pee in the yard (met with lavish praise and treats for appropriate eliminating) and also allowed in the kitchen under close supervision. He marked the sofa once and my messenger bag once by accident but since then no mistakes. When being returned to the crate, we entice with chicken or treats or his food bowl and meal, but he's hesitant to go in. We show him the food and slowly guide his nose into the crate. Day 3 - More of the same - instead of howling for 2 hours after going in, he's progressively gotten better... first 30 minutes, then he settles, then 20, then 10 - after 10+ repetitions of this crating, he now only howls for 1-2 minutes before settling. This is encouraging since it likely means he will be a quiet crated dog, meaning he could likely be a match for a condos and apartments too. For now when we crate during the day, we isolate him socially (upstairs) while we work downstairs, but overnight we let him crate in our bedroom. We let him roam under supervision and since the first two accidents, he's not marked, so hopefully we'll have him reliably potty trained very quickly so that we can stop using the crate for potty training (and start playing fun crating games so that he doesn't have a long-term negative association with crating). Those are great step by step words of wisdom when introducing dogs to crates! I found Susan Garrett's Crate Games dvd comes in handy when I have foster dogs in the house too. You can never have too many resources for your training tickle trunk!